I’m a big advocate of looking up when walking around major buildings. It’s amazing what you’re missing at street level. The Recorder of the Archives hangs above Pennsylvania Ave. Author James Goode called it “the finest sculptured pediment in Washington” in his “Washington Sculpture” book that is the definitive work on the city’s outdoor works. The central figure is an elderly man who receives documents (hence the Recorder) while sitting on rams that symbolize parchment. On both sides of the Recorder are Attendants who are fronted by the winged-horse Pegasus, which symbolizes aspiration. The Attendants present documents like the Declaration of Independence. The remainder of people are those acquiring documents while the dogs are guardians. The 104-foot pediment is limestone and carved by James Earl Fraser. 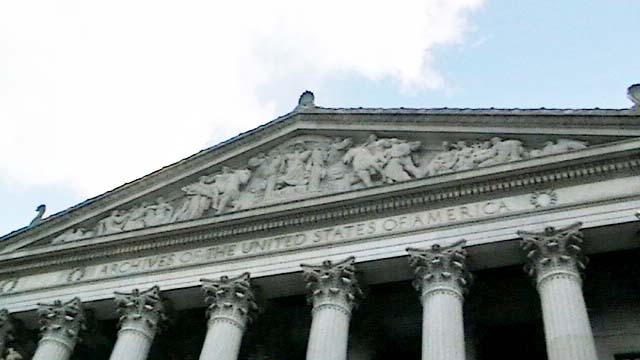 This entry was posted in Monuments and Statues and tagged Best Washington DC walking tours, National Archives, pediment, Photo by Rick Snider, Washington D.C.. Bookmark the permalink.